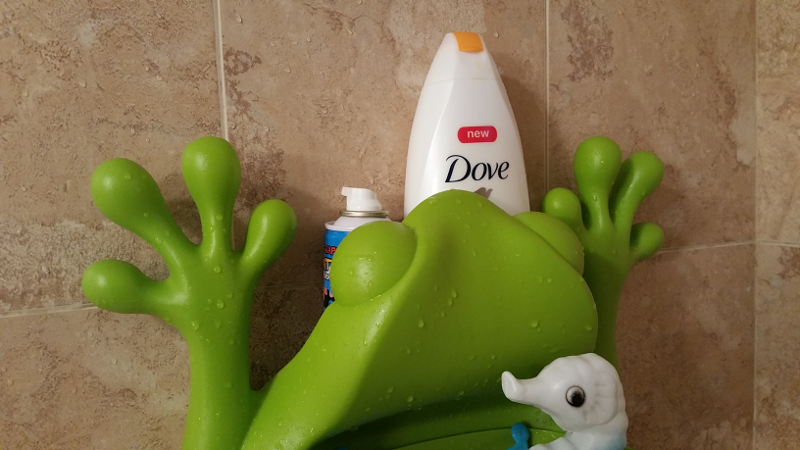 If you have little ones in the house, you probably have what feels to you like hundreds of bath toys in the shower. For my wife and I it got out of hand so we were looking for a solution to keep things a little tidy. We found this frog in our local toy store and gave it a shot. We installed it in the bathtub and quickly found it to be a blessing in disguise. Sure it looks like an innocent little frog but this guy is capable of converting into a scoop that can help with the clean up routine after the kids shower. More than that the kids think its fun to use and end up using it as a toy as well. 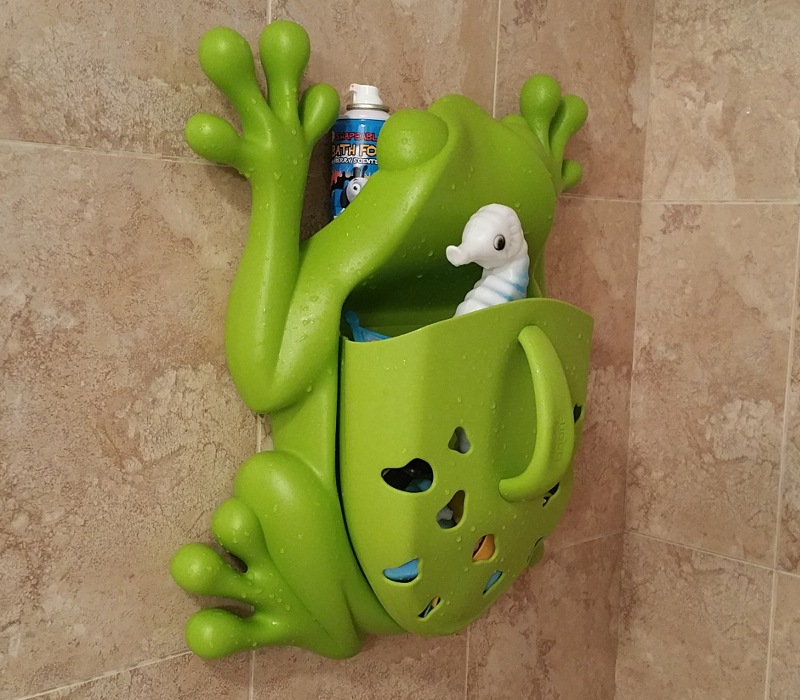 The Boon Frog Pod sticks to the wall using a double sided tape. The tape is good for a while but after about 6 months we ended up having to replace the tape with another 3M tape because the frog came crashing down off the wall. We feel we were being a little aggressive with he frogs capabilities but still it should be expected usage. 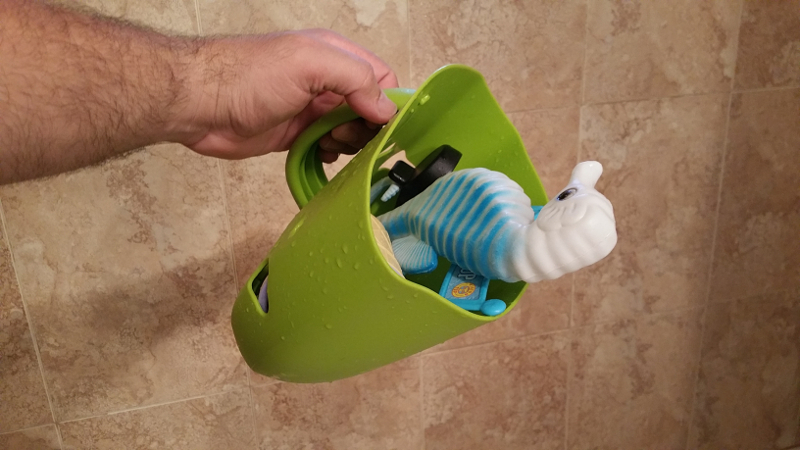 We typically hold three bottles with shampoo conditioner and bath gel on top plus all the small toys inside. Note that the frog is not made for large toys but instead made for smaller items. The frog pod is rather large at dimension of 19" x 16.5" x 7" inches but we feel its a good size to hold smaller toys. Any smaller and it just wouldnâ€™t be worth it. - Clings to the wall and doesn't require space. All in all we liked the frog pod and would recommend it, your kids are also sure to love it. Get your very own Frog Pod on Amazon. We also like to note that there are at least two versions of the Frog Pod. The older one pictured here allows for the storage of bottles above while the new one eliminates that and leaves a larger toy container with a slightly smaller footprint. Both are still available for sale although the older one is getting tougher to find.